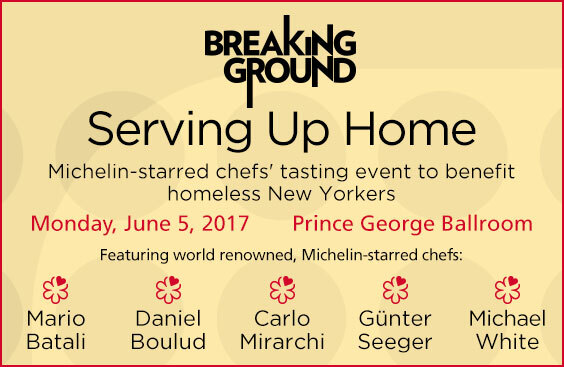 Breaking Ground today announced Serving Up Home, a one-night-only benefit event featuring Michelin-starred chefs Mario Batali, Daniel Boulud, Carlo Mirarchi, Günter Seeger, and Michael White to support critical services for New York City’s homeless. On Monday, June 5th at 7:30 p.m., the chefs will prepare signature dishes to be served at a special fundraiser in the Prince George Ballroom for Breaking Ground, New York City’s largest provider of street outreach services and supportive housing for homeless New Yorkers. Benefit attendees will enjoy the chefs’ tasting dishes, passed assaggi by Il Posto Tuo as well as an open bar and gourmet desserts. Tickets are now on sale athttp://www.breakingground.org/servinguphome/. All proceeds will go directly to benefiting the nonprofit’s street outreach and transitional housing services. “Food brings people together. As New Yorkers, it’s our duty to come together as a community and help those who need our help the most. I’m thrilled to be serving up some of our signature dishes to support an amazing cause: connecting New Yorkers who live without shelter to the assistance that will change their lives,” saidChef Mario Batali. “I opened my first restaurant in New York City more than 20 years ago, and I am always thrilled to be able to give back to the community I belong to and love in a meaningful way. I’m proud to partner with Michelin and my colleagues to support Breaking Ground, a non-profit that has been helping our most vulnerable neighbors since 1990,” saidChef Daniel Boulud. “America is the wealthiest nation in the history of the world. Yet many in our community are without basic tools for life like food and shelter.In Breaking Ground, Michelin— the definitive global network of chefs and restaurants— has identified a partner that’s doing important work in my local community. I am thrilled to lend my support alongside this exceptional group of cooks,” saidChef Michael White. For more information about the event and to purchase tickets, visithttp://www.breakingground.org/servinguphome/.